Krafty1: Taming of the Squeal? Another Sunday, another Open House. One day, very soon we hope, we will no longer need to clean and prep for such things. Everything is on hold until that day arrives and we will be SO very happy for SO many reasons...including the possibility of a new appliance; a dryer. For awhile now, it's been "squealing"...a high pitched, obnoxious squealing noise that makes us want to silence the thing. We decided that attempting to clean any lint from the interior might be an option. 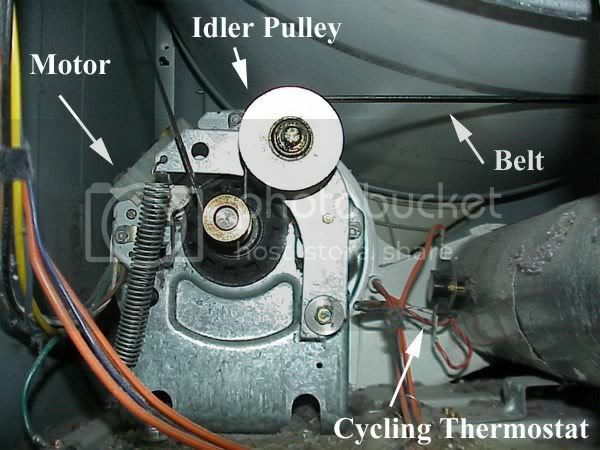 So, I did what any good novice would do (after all, WHAT do I know about taking apart a dryer!?!) and pulled out the owner's manual. 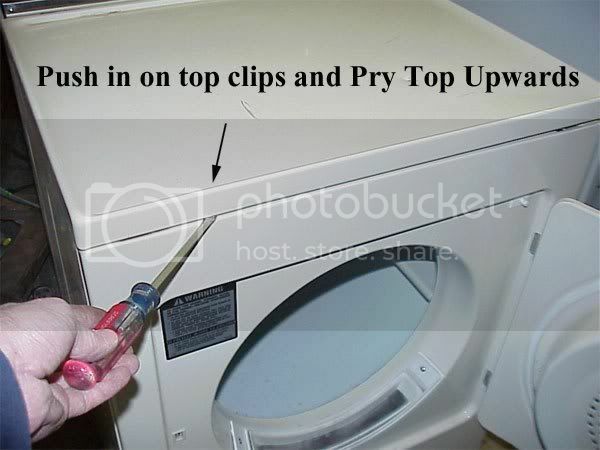 Next up, an Internet search where I found FixItNow.com and more specifically "dryer disassembly" where I learned how to pop off the top and remove the front panel screws. We did NOT attempt to unstring the belt in order to pop out the drum. But we did manage to get it taken apart enough to do a bit of cleaning. See that bit circled in white? The plastic tab that the drum rests on is broken. While vacuuming out the lint from around the drum, the piece got caught in the suction...turns out it is one of the drum stabilizers. Since it had snapped off, the drum was rubbing on the pad...hence the rust areas...friction, moisture and heat...not a great combo. A bit of Krazy Glue on the broken tab (notice how the part that was still attached was rubbed to much smaller!?! ), a bit more cleaning and we reassembled the dryer. Fingers crossed, we loaded some laundry...crap...it started squealing louder than before...for the first three minutes...and then it stopped squealing. The first load just finished. 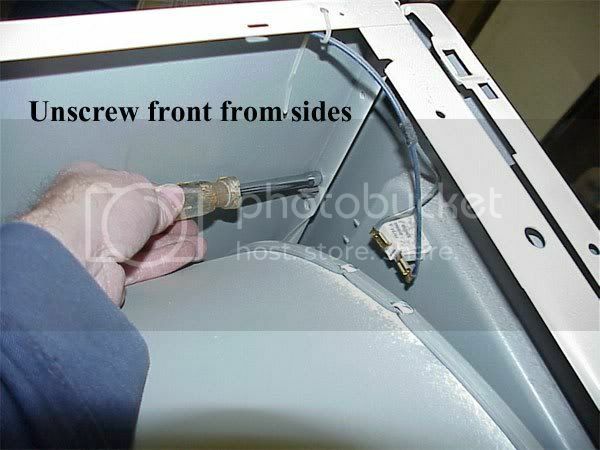 Bonus:a separate problem related to the dryer sensor was fixed with the cleaning. However, the handle has long since been broken. Pliers work just fine...and when there's an open house we slap on the old handle "for show". We'll see if the squeal is still gone with the next load. For now, it's time for some peppermint tea. Thanks to Dutch Knitter Willemtje for leaving a comment about using peppermint tea for the sulfa nausea. There's always peppermint tea on hand here for a nasty cold, but it also helps abate the nausea...thanks for the tip! If only the dryer situation were as easy! Too bad hiring someone to look at it is so blasted expensive...just to have them walk in the door!!! 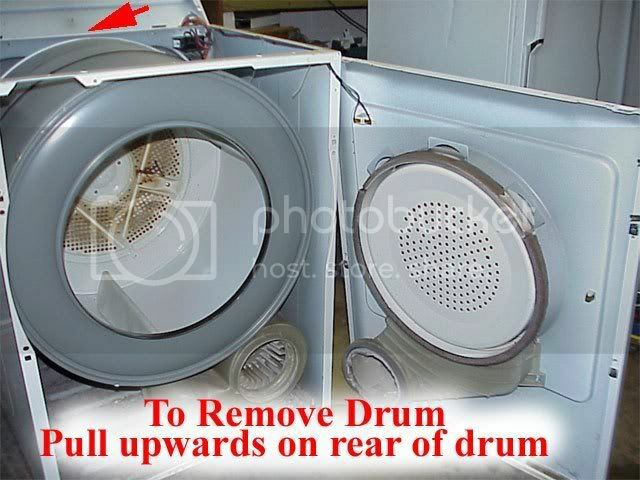 Hence, once the house sells, we'll be looking at a new dryer...probably cheaper than a repairman! Good for you! So many things we really can do when we find ourselves between the rock and the hard spot. Great Job!! Dad said if the glue does not hold he will come over and epoxy it for you.